Why upgrade to 6″ eavestroughs? Bigger roofs mean more water and there is no point in installing eavestroughing if the water will overflow near the foundation. Bigger is better— the handling of the volume of water is drastically improved! The material is a heavier gauge (thicker) and is stronger. We will color match to make sure everything blends in. We offer different sizes for different needs. 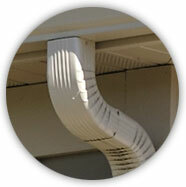 When downspout locations are limited or the roof is large bigger downspouts are a smart upgrade. They enhance the flow of water and makes sure the water is properly evacuated. Our installers are trained to use only the best installation techniques. With our 25-year warranty on our materials and labour, is it our promise to you, to offer the best service and follow up possible for your gutter installation in Ottawa. Over time, gutters show signs of wear and tear caused by the outside elements like wind, rain, snow, sun, etc., and need repair. We have provided gutter repair in Ottawa and surrounding areas since 1988. Call us today for a free estimate!